We just concluded an outstandingly run LAK15 conference hosted expertly by Marist College, Poughkeepsie NY. In the closing panel, a few of us shared thoughts on the state of the field. We were invited to comment on what struck us at LAK. Firstly, the record-breaking 300 (?) delegate numbers, especially ~100 newcomers (right? ), was very heartening. Also, the serious level of sponsorship from companies reflects the rise of the field and the growth of the marketplace. In a far-from-systematic analysis of LAK trends, like Prog Chair Agathe Merceron in her opening welcome, plus several others, I’ll pick out Writing Analytics as theme of the year. We convened the pre-conference workshops on Discourse-Centric Learning Analytics (DCLA13; DCLA14) in order to bring in key researchers in fields such as CSCL and AIED. In a similar vein, this year LAK invited Danielle McNamara, SoLET Lab Director at Arizona State University, as a keynote speaker. 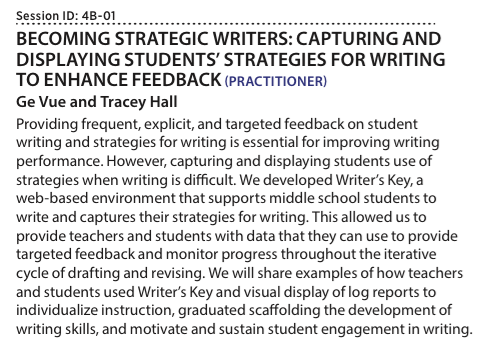 This put writing analytics on the radar for many delegates, making them aware of different classes of writing support tool, and the capacity of text analysis to give insight into the cognition and emotions of student writers. The ASU team had a strong presence in LAK15 papers/demo [7-11], also strengthening the relevance of LAK to the K-12 community. In addition, there were papers spanning very different technologies, and genres of writing, from Queensland University of Technology (adults, reflective writing), and The Open University (adults, masters-level essays) [12-13]. Interestingly, the fact that they ran out of time to embed visualisations in the tool meant they hand-generated prototype views in Tableau, in order to elicit reactions. A simple bubble chart showing the most frequent words used proved to be most useful. Not surprisingly, automated essay grading evokes strong reactions from many people. In my own mind, a more appropriate strategy to pursue (at UTS:CIC) is to place a lesser burden on the technology, and also avoid any suggestion that skilled readers can be automated out of their jobs. Right now, students receive zero feedback on drafts — there simply isn’t the human capacity to do so except in exclusive educational settings with extremely low teacher-student ratios. Yet we know that timely, personalised, formative feedback on work-in-progress is about the most powerful way to build learner confidence and skill. So the use case that I (and UTS academics) find most compelling is that of students checking their draft texts. We’ve gone from spell-checkers, to grammar checkers, to readability checkers, to plagiarism checkers. Next step in evolution: academic writing checkers.